Mistletoe, with its green leaves and white or red berries, is a common Christmas decoration across Europe and in North America. This plant has a special place in the Christmas culture of the West and is often found in holiday arrangements or used alone as small sprigs. Mistletoe can be dangerous, however, so don’t forget to warn others of its potential side effects. Any couple which finds themselves standing under a sprig must kiss. Once it is cut from a tree it may not touch the ground. It must be the last Christmas decoration taken down on Candlemas (2 February). Springs left hanging all year round will protect a house from fire. Sprigs must be updated each Christmas Eve. Symbolising peace, love and goodwill. Though mistletoe has many meanings it can also be used simply as a festive addition to a holiday arrangement. When combined with other greenery mistletoe can be woven into outdoor wreaths, Advent wreaths, garlands and swags, layered into centrepieces or accessorising pomanders or Christmas balls. Mistletoe combines particularly well with evergreen branches, holly, ivy, boxwood, magnolia leaves and with other accents like pine cones. Arrangements of traditional red and white flowers such as roses and tulips can also be filled out and made more festive with mistletoe. Stringing from yarn or wire, ready to be hung from doorframes to encourage couples to kiss. Threading on pins, ready to insert into the ribbons on clove pomanders. Attaching to double-sided tape in order to add to gift wrap. Gluing to cheap hair clips, headbands, tie pins or plain broaches as accessories. Fixing to the top of empty, sanitised jars for easy containers for homemade gifts. Adding to boutonnières and corsages for a festive touch at winter weddings or balls. Unfortunately, for a lovely as mistletoe looks as a seasonal decoration it can also be dangerous. Mistletoe is actually a semi-parastic plant which attaches itself to healthy shrubs and trees in order to thrive. At the least mistletoe can stunt the growth of its hosts, at most it can kill them. Mistletoe leaves and berries can also be dangerous to humans if consumed. They can lead to seizures, a slowed heart rate, vomiting, diarrhoea and fluctuating blood pressure. The severity of symptoms tends to increase with the amount eaten, and death could result so it is important to keep mistletoe decorations out of the hands of infants and children. 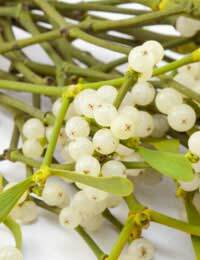 Working with mistletoe is practically imperative for florists during the Christmas season. Understanding the traditions associated with mistletoe is important for knowing how best to display it, particularly in holiday arrangements and as single sprigs. Mistletoe can be dangerous to other plants and humans, so communicating warnings about mistletoe is necessary as well.